It’s now official – Year 2016 is a year of weddings, at least for the telly world! Joining the gang of the newly married couples Divyanka Tripathi-Vivek Dahiya, Sambhavna Seth-Avinash Dwivedi, Siddhant Karnick-Megha Gupta, Sahil Mehta-Eesha Danait, is the new Mrs & Mr Hunar Hale and Mayank Gandhi. 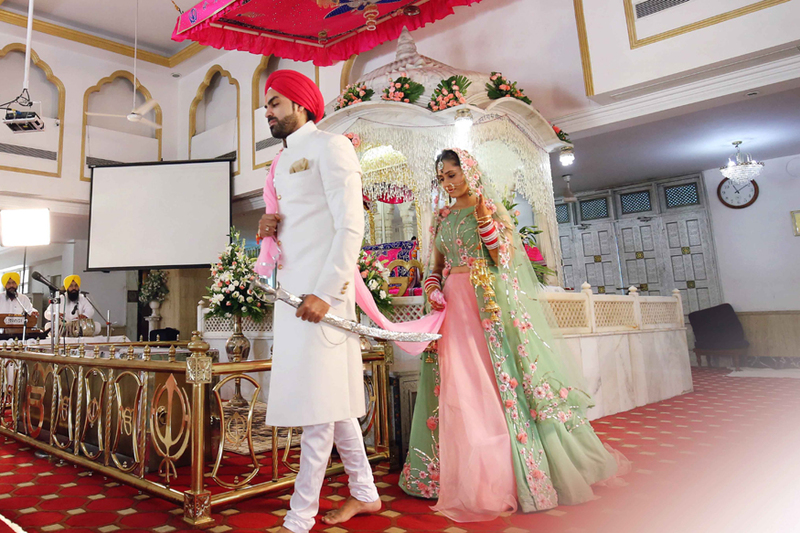 The cute couple took their wedding vows in a pure Punjabi style on August 28, 2016 in a Gurudwara in the capital city. Here’s a dig at their wedding story, but before that get a sneak peek about the stars. Hunar Hale & Mayank Gandhi – Who They Are? Hunar Hale is a famous Indian television actress who made her debut in 2007 in the serial, ‘Kahanni Ghar Ghar Ki’. Since then, Hunar has done several television shows including, ‘Ek Boond Ishq’, ‘Kehta Hai Dil Jee Le Zara’ and ‘Chhal-Sheh Aur Maat’. Currently, she features in the TV series, ‘Dahleez’. Mayank Gandhi, on the other hand, shot to fame with his victory at the Splitsvilla season 7. The National School of Drama certified actor has been seen in several noted television series including, ‘Pyar Tune Kya Kiya’, ‘Kasamh Se’ and the current, ‘Kaala Teeka’. Interestingly, despite hailing from the same fraternity, Hunar Hale and Mayank Gandhi never met each other until their families officially introduced them. What’s more, their respective families played the role of the cupid as well, as they thought them to be a perfect match. 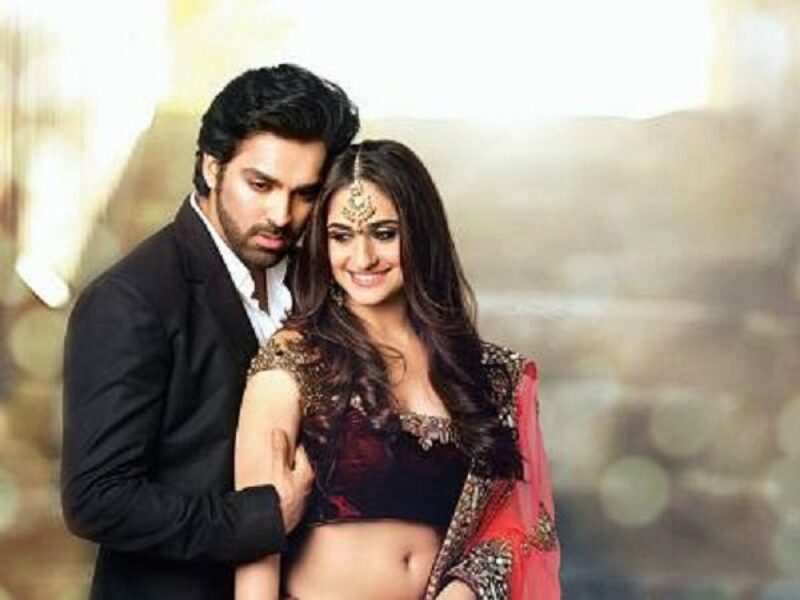 Mayank, at that time, was fresh out of his break-up with ‘Yeh Hai Mohabbatein’ actress Mihika. Hunar, on the other hand, too had her share of past. Surprisingly, when their families introduced them to each other for marriage both Hunar and Mayank weren’t prepared for settling down, but each thought of giving it a try! Quite alike, must say! At a time, when most couples are choosing their partner on their own, Hunar and Mayank’s love story is somewhat traditional. They fell in love after saying ‘Yes’ to each other. To seal their love, a ‘roka ceremony’, which was a quiet affair, was held earlier in the year. Regular meetings and dates gave the two an opportunity to know each other well. Remarkably, they found out that the two complemented each other perfectly – Hunar being the bold, beautiful and rebellious type and Mayank being the sauve, smart and sombre types. While she brings in the chirpiness and life to their love story, he perfects it with his maturity and understanding. They knew each other’s flaw and weaknesses but still couldn’t stop falling in love with each other. Well, who can say theirs’ wasn’t a love marriage? Hunar and Mayank’s wedding looked straight out of a fairy tale. The grand extravaganza was held in Delhi, their home town. Just like any other Indian wedding, engagement ceremony followed by Mehndi and Haldi marked their wedding celebrations. 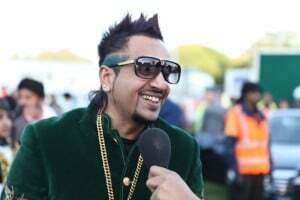 Though they took the wedding vows in the serene ambience of the Gurudwara at Greater Kailash, it was followed by a boisterous reception party at Janpath Hotel. The engagement ceremony, held on August 27, 2016 was a lavish one, and was attended by family members. Actor Sunil Shetty was also present at their engagement ceremony. While Hunar Hale looked every inch of a diva that she is, in the heavily embroidered maroon and golden outfit, Mayank Gandhi nailed it with his dapper look in a monochrome tuxedo suit. The two complemented each other perfectly well. They exchange rings post which dance and music filled the ambience. The duo even picked up a number from a DJ and showed off some of their dance moves! 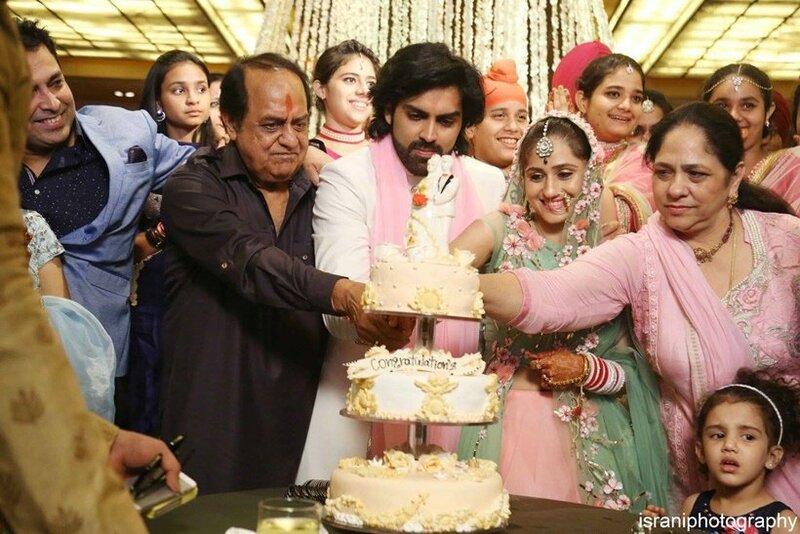 Hunar’s haldi, mehndi and chooda ceremony was a close knit family affair. In a lime-green and yellow suit, she was glowing and brimming with smile, laughter and joy. She seemed thrilled and happy and enjoyed every moment of her wedding ceremonies and rituals. 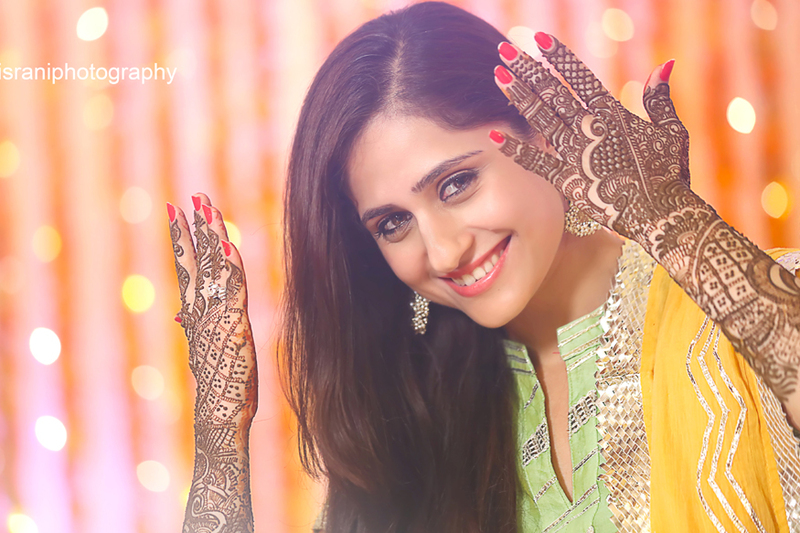 Her mehndi was minimal yet elegant and beautiful. Post mehndi, haldi ceremony had the family reeling in fun, excitement and exuberance as they coloured the hues and ambience in yellow. The bride-to-be was drenched in the auspicious haldi, with her face, neck, hands and legs all smeared and covered. Haldi was followed by the chooda ceremony. She glowed in the pink suit with the red chooda on her hand, indicating that it was just a few hours before she officially became Mrs Mayank Gandhi! 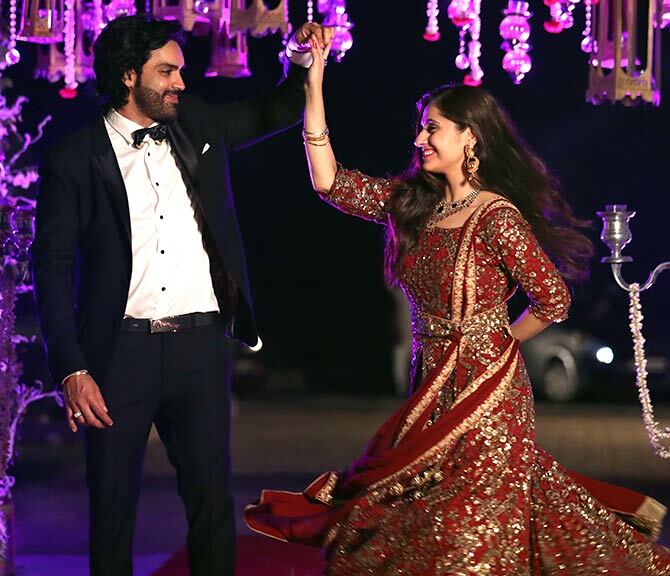 The pious bond of love becomes reverent with marriage – and the wedding ceremony of Hunar Hale and Mayank Gandhi was every bit of a sacred and blessed affair. The serene Gurudwara at Greater Kailash played the host for the bride and groom to seal their amazingly awesome love story into the lifetime bond of marriage on August 28, 2016. Hunar broke the cliché of wearing red on the D-day by opting for a pastel green and pink front cut flowery embroidered lehenga. She perfected the look with a nose pin, maang tika, gorgeous earrings and red chooda. 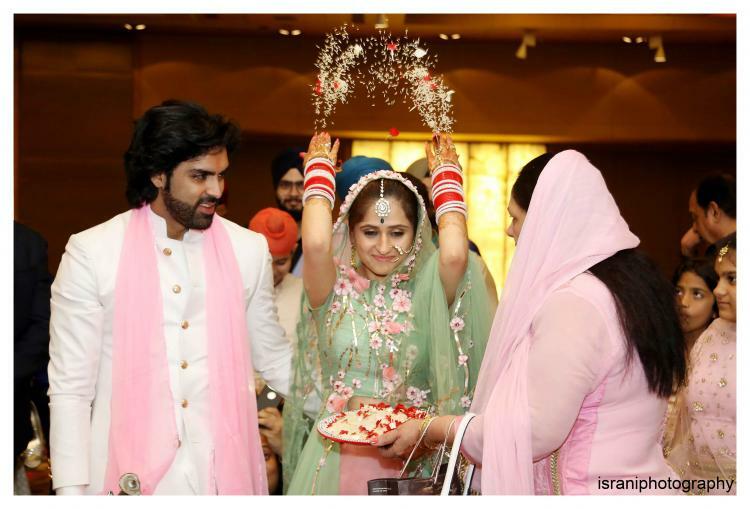 Matching her in style was the groom Mayank Gandhi, who looked like a dashing handsome jatt in his white shervani, hot pink turban and pink dupatta. Stunning as the couple looked, their chemistry was equivalently brimming. Hand in hand, they took the pheras and prayed to God for eternal blessing. 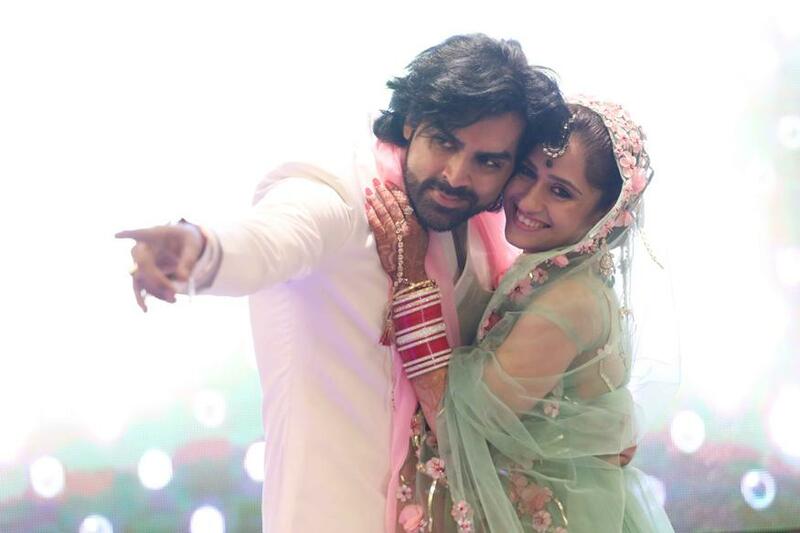 If the wedding ceremony of now Mrs & Mr Hunar and Mayank Gandhi was pious and soulful, their reception party was extravagantly boisterous and over-the-top. At Janpath Hotel, Delhi, inhibitions and hang-ups were blown up as family and friends let their hair down, dancing and singing to their heart’s content. The ambience was filled with excitement, exhilaration, enthusiasm and exultation and the air reeked in ecstasy and joyfulness. The couple seemed almost inseparable as they enjoyed each other’s company. A three-tier cake got the cake cutting ceremony on a roll following which music, dance and food took the better off the celebration. We congratulate the cute couple on their marriage and wish them a bright and happy married life ahead! They definitely deserve all the happiness and bliss that marital life has to offer!